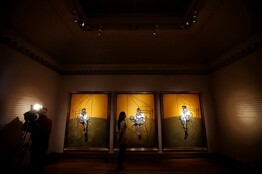 The big news in the art world last week was the record-busting auction at Christie’s in which $142.4 million—a world-wide auction record for any work of art—was spent on “Three Studies of Lucian Freud, “ a 1969 triptych by Francis Bacon. You don’t have to be a Marxist or an advocate of sumptuary laws to be made queasy by such numbers, much less to wonder whether something has gone wrong with the values of the world of art. Where to start sifting through the nonsense? For openers, Mr. Gates would do well to find a better guru than Mr. Singer, whose greatest-good-for-the-greatest-number approach to moral philosophy (if you want to call it that) has led him to advocate, among other horrific things, what he politely calls “permissible infanticide.” It strikes me that Mr. Gates might possibly want to be a bit more careful about the intellectual company that he keeps. More to the point, though, it seems clear to me that Mr. Gates thinks it immoral for rich people to give money to museums instead of medical projects, presumably those that have received the official Bill Gates Seal of Moral Approval. To be sure, he deserves full credit for putting his own money where his mouth is: The Bill & Melinda Gates Foundation gives away some $4 billion a year, much of which is used to support health-related initiatives in developing countries, including a world-wide initiative to stamp out polio. Good for him—but when it comes to art, he’s got it all wrong, and then some. It almost embarrasses me to restate for Mr. Gates’s benefit what most civilized human beings already take to be self-evident, which is that art museums, like symphony orchestras and drama companies and dance troupes, make the world more beautiful, thereby making it a better place in which to live. Moreover, the voluntary contributions of rich people help to ensure the continued existence of these organizations, one of whose reasons for existing is to make it possible for people who aren’t rich to enjoy the miracle that is art. If it weren’t for museums, you wouldn’t get to see any of the paintings of Rembrandt and Monet and Jackson Pollock (and, yes, Francis Bacon). Instead they’d be hanging in homes whose owners might possibly deign to open their doors to the public once a year. Maybe. It is, as they say, a free country, and rich people get to do whatever they want with their money. They can spend it on paintings or children’s hospitals or beach houses. But the surprising thing—or maybe not—is that so many of them believe in helping to make the world a better place for their fellow men. Nor do I hear any groundswell of support among the rich for Mr. Gates’s rigidly utilitarian view of charity. Perhaps that’s because the desire to partake of beauty is so deeply rooted in the human soul. Flip through a book of quotations and you’ll see an abundance of testimony to its lasting importance throughout the whole of recorded history. I especially like what Somerset Maugham said in his novel “Cakes and Ale”: “Beauty is an ecstasy; it is as simple as hunger.” So it is, and sooner or later most of us will long for it as we do for food. What could be more honorable than for a rich person to help satisfy that hunger in the same way that he might underwrite the operation of a food bank? Indeed, many philanthropic organizations see no need to choose. The Doris Duke Charitable Foundation, for example, supports the performing arts and medical research. Think that over the next time you feel inclined to sputter with rage over the results of the latest big-ticket art auction. While you’re at it, remember that in the long run, the chances are very, very good that the paintings for which “some rich guy dropped millions” will end up in a museum, perhaps even one that, like New York’s Frick Collection or the Phillips Collection in Washington, was built by the rich guy in question. And think about this as well: Of course it’s admirable to help prevent blindness—but it’s also admirable to help ensure that we have beautiful things to see.